In this case, there were several. 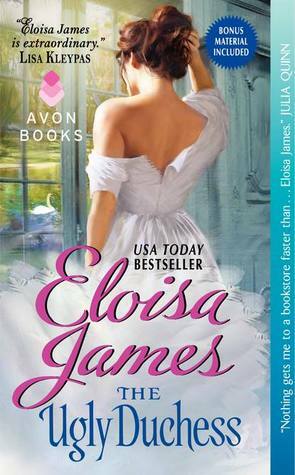 1) I received the e-ARC from the Avon Addicts program; 2) Trish from TLC Book Tours asked me if I would like to be part of their tour (yes); 3) Eloisa James is on my list of reliable reads; and 4) I have a weakness for fairy tale romances. So with all that going for it, it jumped up to the top of my Read-and-Review list. James keeps calling Theo "Daisy." This is discussed in the book, the whys and wherefores; and there is even a comment along the lines of how he doesn't really like calling his wife by a masculine name. I've read other books with similar multiple names and nicknames but for some reason I kept getting jarred and confused by the Theo/Daisy switches. I don't know why. Maybe I'm just getting old. Maybe if the nickname had been something derived from Theodora to make the association easier... anyway. It was something of a problem for me. 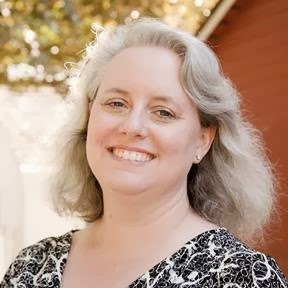 One of my favorite analyses of the elements of a romance is from Joanna Chambers and Jessica "Tripler" from 2009: Excruciating Moments in Romance. I have referred to it before, and here I am doing it again. I personally differentiate it from the romance convention of the "Black Moment," which is more specifically defined as closer to the end of a romance, when it seems that there is no way the hero and heroine can make their way back to each other. The Excruciating Moment will typically happen early in the book to set up the conflict between the two characters-- and while there are very few romances without some sort of Black Moment, the Excruciating Moment is most typical of character-driven romances featuring internal conflict, and not every romance uses it. I'm taking a little time to set this up because the Excruciating Moment in The Ugly Duchess is just so, so, very.... excruciating. On the surface, it's not particularly unique to romance - hero finds himself needing to marry heroine for pragmatic reasons - there's a dowry involved, as well as family scandal to avoid - and deceives the heroine into believing it is strictly a love match. We all know that the truth hangs like the Sword of Damocles over their romance, and when it falls? Yeah, that's the moment. As I said, this is a pattern that isn't hard to find in romance, but it's James' particular talent with characterization that makes it Excruciating. With a capital "E." Honestly, I had to put the book down a couple of times as the scene approached, I was dreading it that much. In the time After... she had the truth. A large part of the book takes place while the two are separated. Theo rescues the estate from near-ruin and to the ton, she flips the bird [see what I did there??] by becoming a trend-setter in the way that only someone who is powerful, wealthy, and more than a little contemptuous of society can do. I really enjoyed the details of both of Theo's endeavors. ...[SNIP]... there was something magnificent about the countess tonight, almost hypnotic. The pièce de résistance of her costume was a formal cape that gleamed under the light, soft and lustrous, almost as if it were made of fur. "What on earth is that made of?" Claribel couldn't help asking as she reached out to touch it. "I can guess," Cecil put in, the thread of amusement in his voice even stronger. "Oh can you?" Theo remarked. "Then tell me this: am I being altogether too obvious?" Claribel hadn't the faintest idea what she meant. But Cecil, clever Cecil, obviously did, because he bellowed with laughter. "Swansdown," he said. "Gorgeous swansdown, and every man and woman in this room has taken note of your swanlike triumph." By the time the meeting was drawing to a close, James felt like jumping out the library window and running into the street, screaming. He was an idiot who would never be able to manage his own estate because he couldn't bear thinking or talking about numbers. As Reede prosed on, his entire body tensed with the fervent wish to get the hell out of the library. ...[SNIP] It wasn't that he couldn't do mathematics or accounting; he'd learned both in school. But his concentration constantly slipped in the face of such calculations, and he found himself thinking about not selling horses for profit but about the ways he planned to repair the stables. ...[SNIP]... The truth of it was that he was a fool who was really only good for scything, because if he didn't get into the fresh air and exercise hard every day, he couldn't control his bloody, bloody temper. When James returns to Theo, he is no longer an elegant, lean, handsome dandy. Seven years at sea have left him scarred, tattooed, and far bulkier than when he left. This might sound appealing to a modern reader (um, yeah...) but the facial tattoo in particular puts him beyond the pale of Regency society, even as Theo conquers it. 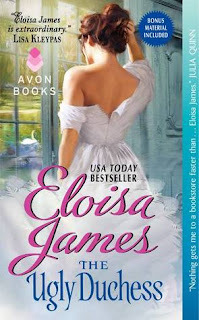 Eloisa James executes these two arcs with perfect symmetry, giving us the fairy tale's moral about "judging by appearances" forward and backward. Social commentary aside, it's just good fun watching these two reconnect. 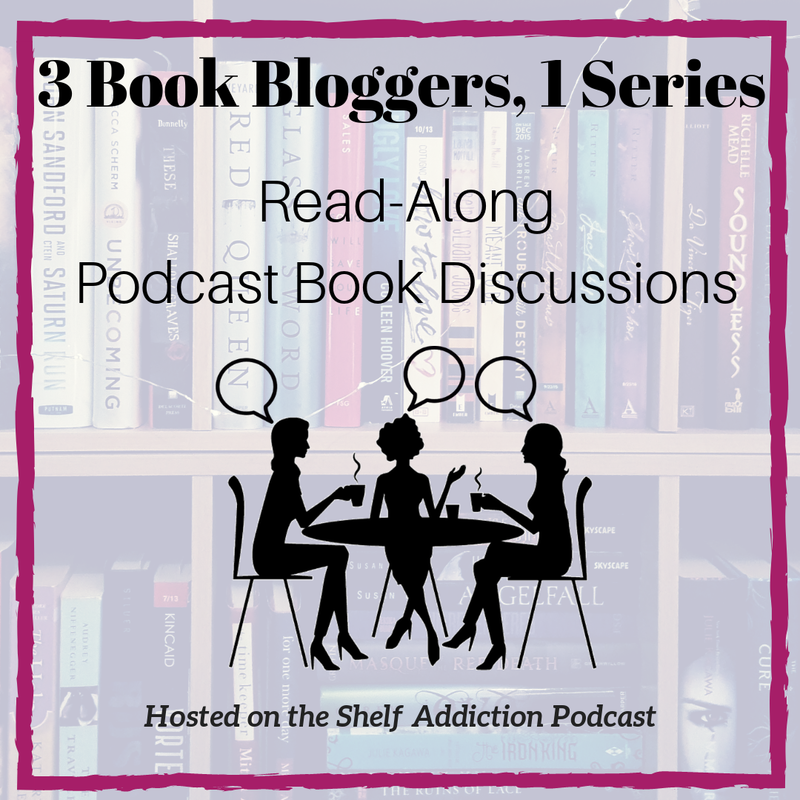 As tragic and serious as their separation was, their reunion is painful and yet the author threads the scenes liberally with humor and human-ness. While James' whole new life is dangerous and reckless, it isn't until he encounters an especially close brush with death that he decides to give up privateering and return to his wife and estate. Both of them have grown up and overcome certain insecurities, but to some extent, the way they accomplished that was to construct a public facade. Especially for Theo, allowing the other behind that facade, allowing that vulnerability, was a very difficult process indeed, and makes for a wonderful reading experience. This is a couple who work long and hard for their happily ever after, both alone and together. By the end, you'll feel that no fairy-tale couple ever deserved it more. It's been a pleasure to be a part of TLC's book tour for The Ugly Duchess. Please check out other stops along the way at TLC's homepage for The Ugly Duchess Blog Tour. I love fairy tale re-tellings, and you make this one sound especially good!